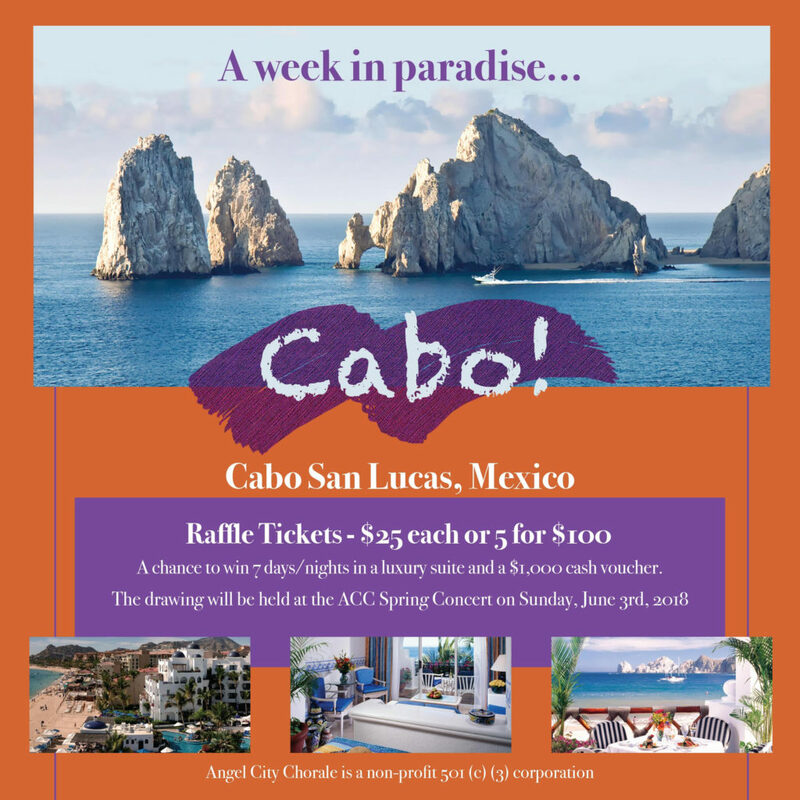 Angel City Chorale is raffling 7 Days & Nights and a $1,000 cash voucher to bask in Old World Luxury on the shores of the magnificent Cabo San Lucas luminous Pacific Coast. Raffle drawing will be held after our Spring Concert on Sunday June 3, 2018. Ticket holders need not be present to win. Here’s what’s in store for your week in paradise…. Relax in your Junior Ocean View Suite…. With over 538 square feet of living space, our luxurious ocean-view Junior Suites feature a fully-equipped kitchenette for convenient in-room dining, plush living area with over-sized chairs facing the ocean, elegant sleeping quarters furnished with one king bed or two queen beds, and a private balcony or terrace with outdoor seating. There is so much to do at Sunset Beach…. For your dining pleasure, experience decadent Los Cabos cuisine at one of five restaurants…. Our delicious restaurants and bars offer extensive choices for your dining pleasure. Whether it’s a romantic candlelight dinner for two, a poolside snack, family dining or a relaxed meal in the privacy of your suite, Pueblo Bonito Sunset Beach Golf & Spa Resort offers choices for every taste, any time of day. Angel City Chorale reserves the right to cancel this raffle and refund purchased tickets at any time prior to the drawing.